Our concert on 10 April at 7.30 pm in Madrid in the series The Boulangers and their students can be seen live in the video stream on the homepage of Fundación Juan March. Our Juon-Tchaikovsky CD was voted the best chamber music recording of the fourth quarter of 2018 by the committee “Preis der deutschen Schallplattenkritik”! This CD is really enjoyable. The recording is solid: clear and direct, with little surround sound, the Boulanger Trio simply plays fabulously, fits together in the sound and in the common musical idea, the Trio of Paul Juon is quite a discovery and also the Tchaikovsky on this recording is absolute worth listening to. From August 31, our new CD is available in stores! With the recording of the trio op. 50 by Peter Iljitsch Tschaikowsky and the Litaniae op. 70 by Paul Juon, we have been able to realize a heart project, to whose success our sound engineer Stephan Schmidt and Andreas von Imhoff from our label CAvi-Music contributed significantly. The pre-sale for our Boulangerie with Friedrich Cerha on September 29 at the Elbphilharmonie has begun. We are happy to have Friedrich Cerha as guest, who will come to Hamburg and Berlin despite his advanced age of 92 years! Today at 8 pm you can listen to a recording of our concert with the program 1918 – In der Schule wurden die Bänke leer on BR klassik with Johann von Bülow from the former synagogue Fellheim. Today the presale starts for our concert at the Elbphilharmonie together with Johann von Bülow. Our selection of music and text, played by us and read by Johann von Bülow, deals with the topic ´One hundred years end of World War I´. The selected works reflect the time in sound and word. 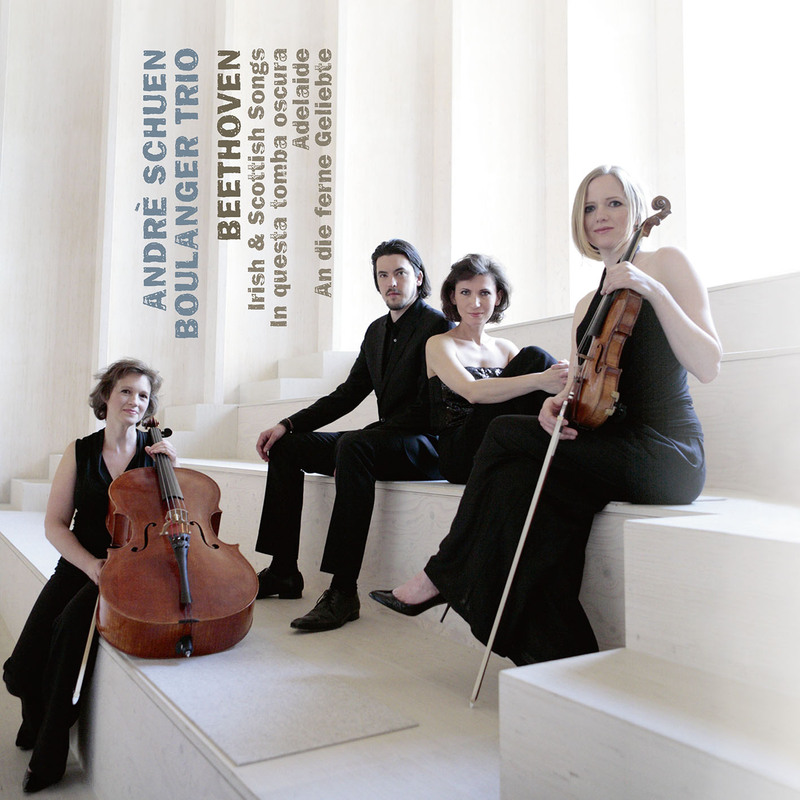 The Boulanger Trio has come up with reinforcements for their latest album: Together with baritone André Schuen they create excellent interpretations of various Beethoven songs. 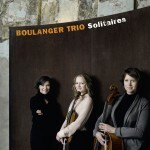 Once again, the internationally acclaimed Boulanger Trio managed to surprise the classic market with their latest CD. Together, the four artists have met an interesting selection of songs by Ludwig van Beethoven, from which they conjure extremely lively and simply rousing recordings. In the few pure instrumental works of this song compilation, the individual instruments merge into a homogeneous sound body. Their interpretations are intense yet sensitive, tender and very natural. The lyrics to the Beethoven songs of our new CD can be downloaded here. Tomorrow, on the 14th of July, our new CD will be released! Together with the baritone Andrè Schuen, we were able to realize a heart project: the Scottish and Irish songs by Ludwig van Beethoven. In the BR Television a nice documentary about the baritone Andrè Schuen was shown, in which we will be present at 6:04 in concert and at rehearsals for the new Beethoven CD. The program is still available in the media library of the BR. We were asked in the short term to play tomorrow in Hamm, instead of colleagues who had to cancel due to illness. It is a great program with works by Fanny Hensel, her brother Felix Mendelssohn and Lili Boulanger. The commitment of the sisters [Nadia and Lili Boulanger] to the new and the more unknown music is inspiration and role model for the Trio Boulanger, founded ten years ago in Hamburg. This was demonstrated by the program, because an evening where three of four pieces rarely appear in our concert life and are presented with heart blood and passion is rare. The audience in the Festsaal Weißenau thanked the trio with concentration and enthusiasm. That evening violinist Birgit Erz, cellist Ilona Kindt and pianist Karla Haltenwanger played works by Johannes Brahms, Ernest Bloch, Edvard Grieg and Max Reger: It was a bath in the romantic sound, which the musicians however made transparent with great diversity and nuances. In July, the Boulanger Trio visits again for the wonderful project Rhapsody in School two Berlin schools. Young people get the opportunity to meet famous artists in person and have insight to their lives, their experiences and personal development. The musicians can reach the children through their own passionate commitment to set their own goals and course in life. Today we are at the Composer Focus Day at the Wigmore Hall London, which is dedicated to Friedrich Cerha. There we will perform his Three Pieces for cello and piano as a world premiere. At the festival Wege durch das Land, we make two readings of Schiller’s Räubers together with Jens Harzer and Marina Galic. We will play works by Schumann, Mozart and Bloch. From today on, we will record our next CD at the Deutschlandfunk in Cologne. We are looking forward to be deeply involved with small works by Franz Schubert, George Enescu, Mel Bonis, Hans Werner Henze and other. Today we are visiting a school for Rhapsody in School once more. This time it’s the composition class of the Mendelssohn-Bartholdy-Gynasium in Berlin – Prenzlauer Berg. Our latest release has received the Supersonic Award ausgezeichnet! Read the review here. 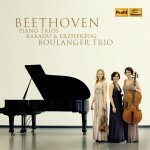 Our new CD with works by Ludwig van Beethoven has been published by Hänssler Profil on July 14. The CD contains the Archduke Trio and the Kakadu Variations as well as the Trio Movement WoO 39.